Making A Mark gives an insanely talented artist some IADW brag-space. Four the next four weeks, this feature will be dedicated to fantastic artists out there who were or are legends of their time, but as the role of an artist is often known to do, don't get the recognition levels they deserve. Instantly first up to bat is Frank Brunner. 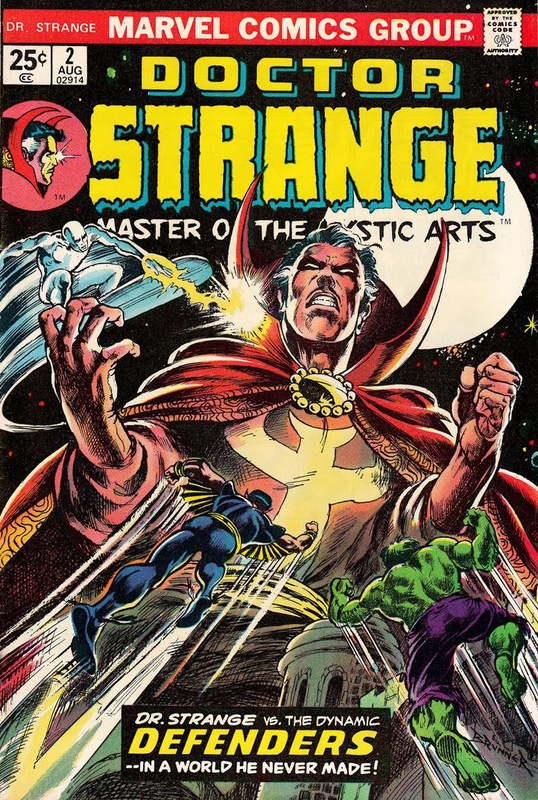 The only artist that can hold a Torch to Frank's Doctor Strange, is Gene Colan. What Neal Adams did for Batman, Brunner did for Stephen - especially in terms of giving the good Doc's cape a character and personality of its own. The linework Frank carved into every piece of his work, highlighted beyond all possibility when he illustrated a naked Alice's jaunt through Wonderland. Vampirella, Red Sonja, Howard The Duck, a whole range of icons have been swept under the pen of this talented fantasy artist. One of the contributing hands to the changing face of Marvel during the 1970's. Yes the 70's - the art that you see on this post that could still rival todays best, was done decades ago. While Frank has returned to Marvel to contribute to the odd Dr Strange special and contributed towards Red Sonja over at Dynamite, like many comic / fantasy artists it has been many years since he left the printed panels to chase on screen creativity in Hollywood. Working on a number of cartoon projects including the bizarrely un-revamped Dino-Riders, Frank was also the head of character design on the unbeaten Fox X-Men cartoon of the 90's. What do you think? To see Frank's official website, click here. Wait- "Unbeaten Fox X-Men cartoon"??? Come on... That 90's cartoon sucked! At the time I only even liked it a little- but it holds up not at all... Every single other X-Men cartoon as beaten it- in story, consistency, character, and animation... Only good thing that 90's show gave us was the awesome Japanese intro they made for their airings... "SHOCK!!! Cry for the moon!" But anyways- nice post. I'm completely unfamiliar with him except for his two Alice in Wonderland portfolios... And I only even made the connection from that first picture. I horde Alice in Wonderland stuff- it's my favorite book since I was a kid. Gene Colan's style very much suites Dr. Strange unlike an issue of Iron Man that I saw his work in once. I've always loved that Man-Thing cover art! Thanks Dave! Yeah I think Colan suits Strange as well. Frank's Man Thing and Dr Strange here are just as good - if not better. He really has that epic cult kinda style huh? You and me both with Alice. It's a book I think like Oh The Places You'll Go a lot of people gloss over. Up until recently I used to collect ways different artists used my favourite phrase "Why, sometimes I've believed as many as six impossible things before breakfast." too.